PerioSciences has developed the market’s first line of oral care products based on the power of antioxidants and natural, plant-based ingredients. 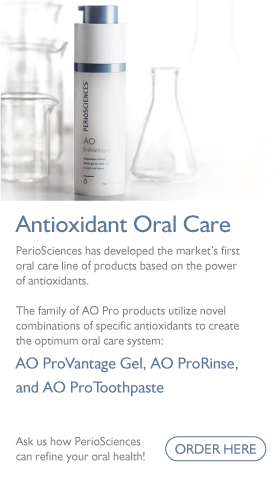 The family of AO Pro products utilize ground-breaking combinations of specific antioxidants to create a natural, safe, and effective oral care system. Perio Science is a medical dispensed therapy with proven results! This topically applied gel harnesses the power of antioxidants, xylitol, and essential oils for specific use in the mouth. AO ProVantage is proven to freshen breath while soothing soft tissue in the oral cavity. The antioxidants in this gel are flavonoids and polyphenols known to inhibit destructive enzymes, and the essential oils like peppermint, thyme, sage, and clove have been used since ancient times to treat inflammation and fight bacteria. Available in Natural, White Care, Sensitive, and Hydrating forms, AO ProRinse is an oral rinse that helps to moisturize and soothe oral tissue, freshen breath, and whiten teeth. Harnessing the power of potent antioxidants, plant extracts, and essential trace minerals, this line of rinses can counteract bad breath while helping the mouth balance its natural salivary defense system to maintain ultimate oral health. Also available in Natural, White Care, Sensitive, and Hydrating options, AO ProToothpaste provides maximum cleaning power without any of the harsh chemicals found in standard toothpastes. AO ProToothpaste uses only natural and plant-based ingredients to polish the teeth, remove plaque build-up, and keep the mouth clean. All toothpastes in this line are completely free of alcohol, fluoride, parabens, and artificial sweeteners! Making the choice to purchase PerioSciences AO Pro products is making the choice to embrace your oral health and enjoy strong, beautiful teeth for the rest of your life.